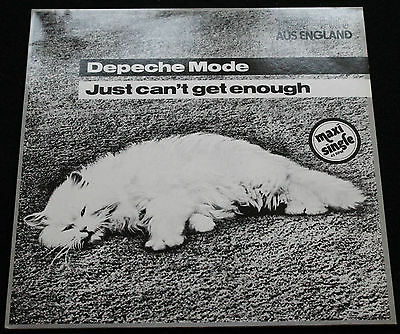 DEPECHE MODE: Just Can't Get Enough / Any Second Now, German Grey Vinyl 1981 Maxi 12”. COVER is superb MINT(-), VINYL is MINT-, barely played, just a few wispy, barely visible hairlines seen under strong light only. Superb Nr MINT sound. Comes with the original see-thru inner. I acceptpaypalandbank-transfers(ask for the nessesary codes). To get shipping quote for a single LP, use shipping calculator.But...for auctions or totals exceeding 80 GBP,please wait for invoice.For 80+ GBP orders anadditional 8 GBPis charged to cover the 75 DKK registration fee.This gives you a tracking number. You will save shipping cost on Multiple items,of course. Wait for invoice and you'll see the combined shipping price. You will NEVER pay more than my actual cost, often you'll pay 10-15% less than is costs me. In other words I try to keep the shipping costs down. Special german-made cruciform-mailers designed for multiple LPs are used, even for single LP packages. The boxes are oversized and thus provide extra corner protection as well as great stiffness to the package. Addtional protection may also be used when found nessesary, such asstiffeners, bubble-wrap, extra corner-protection. I do not charge for anything packing materials. MINT(-)is as close to new as a used LP or cover can get, unplayed or played 1-2 times at most. MINT-issuperb, almost like new. No marks, scratches, clicks, noise, or anything else, aside from possibly a barely visible and inaudible hairline. All minor blemishes will be mentioned in the individyal description. EX or EXCELLENTis also VERY nice, 2-3 light marks perhaps, no disturbing noise, great sound quality. VG+,a nice player, but probably has some visual impairments, and some clicks or light noise in places; always see the individual description. VG,rarely put of for sale, an ok copy, but always see the individual description for the actual faults. I play grade parts of or whole LPs to determine the actual sound-quality of the item. Playgrading is done on a quality system with an Linn LP12 as the main source. The sound-quality of any individual LPis garuanteed to closely correspond to the visual appearance,unless other notes are given in the description. All items are garuanteed– in case of any dissatisfaction, contact me, and we'll sort it out. All items are refundable if returned in the same condition as recieved.